Blaziken is a Fire/Fighting type Pokémon introduced in Generation 3. 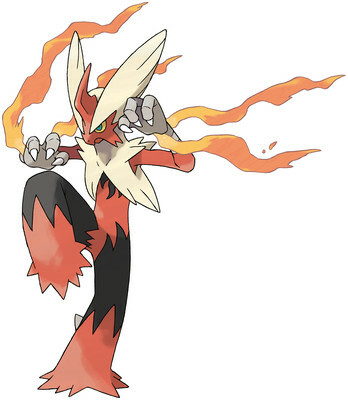 It is known as the Blaze Pokémon . Blaziken has a Mega Evolution, available from X & Y onwards. The effectiveness of each type on Blaziken. In Generations 3-4, Blaziken has a base experience yield of 209. In battle, BLAZIKEN blows out intense flames from its wrists and attacks foes courageously. The stronger the foe, the more intensely this POKéMON’s wrists burn. 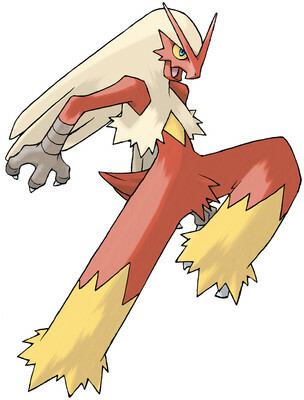 BLAZIKEN has incredibly strong legs - it can easily clear a 30-story building in one leap. This POKéMON’s blazing punches leave its foes scorched and blackened. Blaziken has incredibly strong legs—it can easily clear a 30-story building in one leap. This Pokémon’s blazing punches leave its foes scorched and blackened. Blaziken learns the following moves in Pokémon Ultra Sun & Ultra Moon at the levels specified. Blaziken learns the following moves when it evolves in Pokémon Ultra Sun & Ultra Moon (regardless of level). Blaziken learns the following moves via breeding in Pokémon Ultra Sun & Ultra Moon. Details and compatible parents can be found on the Blaziken egg moves page. These moves can only be learned in Pokémon Ultra Sun & Ultra Moon by a previous evolution of Blaziken. Check the respective Pokédex for the exact details. Blaziken can only learn these moves in previous generations. It must be taught the moves in the appropriate game and then transferred to Pokémon Ultra Sun & Ultra Moon. Blaziken learns the following moves in Pokémon Sun & Moon at the levels specified. Blaziken learns the following moves when it evolves in Pokémon Sun & Moon (regardless of level). Blaziken learns the following moves via breeding in Pokémon Sun & Moon. Details and compatible parents can be found on the Blaziken egg moves page. These moves can only be learned in Pokémon Sun & Moon by a previous evolution of Blaziken. Check the respective Pokédex for the exact details. Blaziken can only learn these moves in previous generations. It must be taught the moves in the appropriate game and then transferred to Pokémon Sun & Moon. In Pokemon Online, why is it illegal to have a female Blaziken? Can you get hone claws on blaziken in sun/moon? If so how?